On my way out of the Grove I stumbled across this little fella with no name. He’s a nine week old “champion class” English Bulldog being sold by Steven Hernandez. Price tag? $2500 (!). If you must have this critter, contact hernandez1230 (at) sbcglobal (dot) net. A cursory search of English Bulldog rescues in the Los Angeles area turned up dry – does anyone know where someone with less deep pockets but a big heart for the bull legged bruisers can find one to adopt? 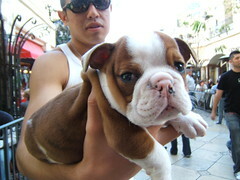 wait, was this guy just walking around the grove, trying to sell his puppy? To anyone who asked anyway. There was no “puppies for sale” sign or anything. Shady, it’s probably stolen. Not to mention you can get registered English Bulldogs for 2K. This dog is probably from a puppy mill. Dude was pretty open about sharing his phone and email with me, and had what he said was the puppy’s mom with him as well. Why are you advertising for this creep? Do you know that our shelters here in Los Angeles have many pedigree dogs? And if you’re interested in adopting a Bull Dog, please consider a Pit Bull. They are amazing companions and have gotten an undeserving bad rap. 200 Pit Bulls are put to death everyday here in L.A. County alone – they need our help. Please remove this guy’s info from your blog. He doesn’t need any help making money off of the suffering of animals – the saying is true that for every dog you breed or buy, a shelter dog dies. Have a heart! That Steven Hernandez guy should get a real job instead of making his money from peddling puppies at the Grove…I’m writing a letter to the Grove about this. They don’t let people panhandle there, do they? Or sell things without some sort of agreement, why would they let some creep walk around selling puppies?